Of all the environmental disaster events that humans are capable of causing, nuclear disasters have the greatest damage potential. The radiation release associated with a nuclear disaster poses significant acute and chronic risks in the immediate environs and chronic risk over a wide geographic area. Radioactive contamination, which typically becomes airborne, is long-lived, with half-lives guaranteeing contamination for hundreds of years. Concerns over potential nuclear disasters center on nuclear reactors, typically those used to generate electric power. Other concerns involve the transport of nuclear waste and the temporary storage of spent radioactive fuel at nuclear power plants. The fear that terrorists would target a radiation source or create a "dirty bomb" capable of dispersing radiation over a populated area was added to these concerns following the 2001 terrorist attacks on New York City and Washington, D.C.
Radioactive emissions of particular concern include strontium-90 and cesium-137, both having thirty-year-plus half-lives, and iodine-131, having a short half-life of eight days but known to cause thyroid cancer. In addition to being highly radioactive, cesium-137 is mistaken for potassium by living organisms. This means that it is passed on up the food chain and bioaccumulated by that process. Strontium-90 mimics the properties of calcium and is deposited in bones where it may either cause cancer or damage bone marrow cells. Concern became reality at 1:23 A.M. on April 25, 1986, when the worst civil nuclear catastrophe in history occurred at the nuclear power plant at Chernobyl, Soviet Union (which is now in Ukraine). More than thirty people were killed immediately. The radiation release was thirty to forty times that of the atomic bombs dropped on Japan during World War II. Hundreds of thousands of people were ultimately evacuated from the most heavily contaminated zone surrounding Chernobyl. Radiation spread to encompass almost all of Europe and Asia Minor; the world first learned of the disaster when a nuclear facility in Sweden recorded abnormal radiation levels. Chernobyl had four RBMK-type reactors. These reactors suffer from instability at low power and are susceptible to rapid, difficult-to-control power increases. The accident occurred as workers were testing reactor number four. The test was being conducted improperly; as few as six control rods were in place despite orders stating that a minimum of thirty rods were necessary to maintain control, and the reactor's emergency cooling system had been shut down as part of the test. An operator error caused the reactor's power to drop below specified levels, setting off a catastrophic power surge that caused fuel rods to rupture, triggering explosions that first destroyed the reactor core and then blew apart the reactors' massive steel and concrete containment structure. The health impacts of the Chernobyl explosion will never be fully known. It is estimated that some three million people still live in contaminated areas and almost ten thousand people still live in Chernobyl itself. The plant itself was not fully shut down until nearly fifteen years after the disaster. Studies by the Belarus Ministry of Health, located approximately eighty miles south of Chernobyl, found that rates of thyroid cancer began to soar in contaminated regions in 1990, four years after the radiation release. Gomel, Belarus, the most highly contaminated region studied, reported thirty-eight cases in 1991. Gomel normally recorded only one to two cases per year. Health officials in Turkey, 930 miles to the south, reported that leukemia rates are twelve times higher than before the Chenobyl accident. The thriller China Syndrome, which warned that a nuclear power plant meltdown would blow a hole through the earth all the way to China and "render an area the size of Pennsylvania permanently uninhabitable" had been playing for eleven days when, at 4:00 am on March 28, 1979, Reactor #2 at the Three Mile Island (TMI) nuclear power plant suffered a partial meltdown. The plant was just downriver from Harrisburg, Pennsylvania. Film story, reality, and perception all interplayed to create near national panic. The accident occurred sequentially. A minor problem caused the temperature of the primary coolant to rise. In one second, the reactor shut down but a relief valve that was supposed to close after ten seconds remained open. Plant instrumentation showed operators that a "close valve" signal had been sent. There was no instrumentation to tell them the valve itself was still open. The reactor's primary coolant drained away and the reactor core suffered serious damage. Fuel rods were damaged, leaking radioactive material into the cooling water and a high temperature chemical reaction created bubbles of hydrogen gas. One of these bubbles burned, creating fears that a larger hydrogen bubble would explode, possibly breaching the plant's containment structure. Some gases were purposefully vented into the atmosphere. It took nearly a full month the bring the reactor into "cold shutdown" status. That said, there was never danger of a massive explosion and hundreds of readings taken by the Pennsylvania Department of Environmental Resources showed almost no iodine, and all readings were far below health limits. There was, however, widespread panic including a unordered mass evacuation. The greatest problem at TMI was a total failure of communication. Internal radioactivity levels, for example, were reported as ambient (outdoor) air readings. 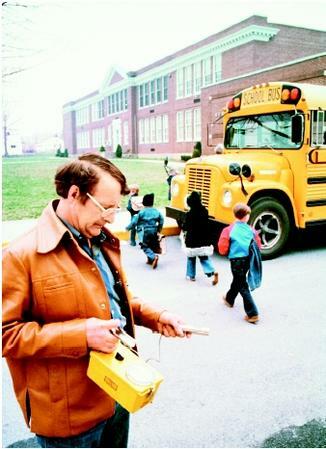 Acivil defense worker is using Geiger counter to check radiation level near a school building following the accidental radiation leak from the nearby Three Mile Island nuclear power plant. Schoolchildren are being evacuated via bus. found no evidence on unusual health trends. TMI's only health effect was psychological stress related to the accident. While there were few long-term health effects, there is no doubt that the accident at TMI permanently changed both the nuclear industry and the Nuclear Regulatory Commission (NRC). "Public fear and distrust increased," the NRC notes in a fact sheet on TMI, "Regulations and oversight became broader and more robust, and management of the plants was scrutinized more carefully." 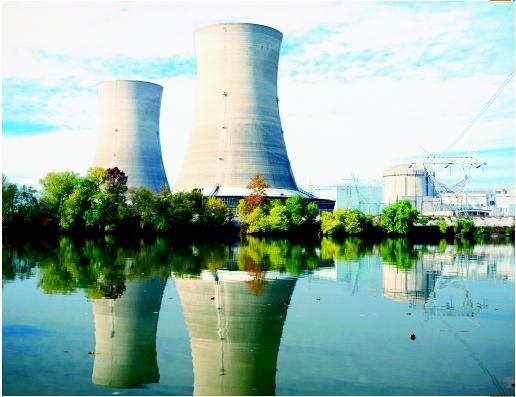 Two cooling towers at the Three Mile Island nuclear plant. speed." A week later, divers opened the rear hatch of the sub but found no survivors. It took salvagers two years, but the Kursk and her two nuclear reactors was raised. The Kursk was the sixth nuclear submarine to have sunk since 1963. The others all came to rest on the ocean floor at depths of more than 4,500 feet, far below where most marine life lives. They include two former Soviet submarines—one that sank east of Bermuda in 1986 and another that went down in the Bay of Biscay in 1970—and two U.S. nuclear submarines—the U.S.S. Thresher and U.S.S. Scorpion —which sank in the 1960s at the height of the Cold War. U.S. Navy officials report there is little likelihood of radioactive release from the U.S. ships. Reactor fuel elements in American submarines are made of materials that are extremely corrosion resistant, even in sea water. The protective cladding on the fuel elements corrodes only a few millionths of an inch per year, meaning the reactor core could remain submerged in sea water for centuries without releases of fission products while the radioactivity decays. Comprehensive deep ocean radiological monitoring operations were conducted at the Thresher site in 1965, 1977, 1983, and again in 1986. None of the samples obtained showed any evidence of release of radioactivity from the reactor fuel elements. Nave, C.R. "Hyper Physics." Available from http://hyperphysics.phy-astr.gsu.edu/hbase/hframe.html . Public Citizen. "Decades of Delay: The NRC's Failure to Stockpile Potassium Iodide & Protect the Public Health and Safety" Available from http://www.citizen.org/cmep/energy_enviro_nuclear/nuclear_power_plants reactor_safety/articles.cfm? ID=4433 . Subnet. "USS Thresher (SSN-593)." Available from http://www.subnet.com/fleet/ssn593.htm . U.S. Nuclear Regulatory Commission. "Fact Sheet on the Accident at the Chernobyl Nuclear Power Plant." Available from http://www.nrc.gov/reading-rm/doc-collections/fact-sheets/fschernobyl. tml . U.S. Nuclear Regulatory Commission. "Fact Sheet on the Accident at Three Mile Island." Available from http://www.nrc.gov/reading-rm/doc-collections/fact-sheets/3mile-isle.h ml . Fears of terrorist attacks on nuclear power plants have prompted state and local health offices to distribute supplies of potassium iodide pills, known as KI, to be taken in the event of a release of radioactive materials. KI blocks the intake of radioactive iodine by the thyroid and helps prevent thyroid cancer. The pills were provided by the Nuclear Regulatory Commission. Hi, im currently doing a history project about the explosion in Chernobyl, and i have taken a quote from this page under the heading 'the chernobyl explosion' but now it comes to where the source came from, who wrote it , when and where ect and i do not know where to find that information? I read about an old Russian nuclear storage facility that was actually in the ocean; at the time it was leaking in to the ocean and a multinational group had convened to look at ways to fix the decaying storage facility/and or move its contents. Apparently this was the primary dumping site for spent fuel rods for the USSRs Navy and icebreakers. They were saying it had the potential to be the worst nuclear disaster in the world. Now I cannot find anything about it; any idea what this facility was called?